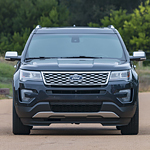 When it comes to providing traction performance, the designers at Ford have incorporated two important features into the Explorer. The Explorer features the Terrain Management System. This system lets you select the terrain you are driving on. The system then provides the traction control necessary to reduce slippage. The Explorer also has hill descent control. This system helps regulate the engine and braking on steep declines. If you come for a test drive at Victory Ford in Kansas City, you will learn more about these and other great features on the Explorer. Schedule a test drive as soon as possible.